In June 1995, a virtually unknown group of Japanese musicians embarked on the monumental task of recording the complete sacred cantatas by Johann Sebastian Bach. 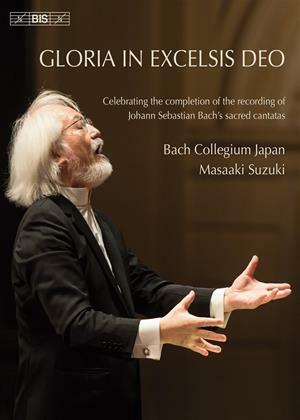 Almost eighteen years later, on 23rd February 2013, the Bach Collegium Japan and Masaaki Suzuki - by then household names in the international music world - reached their goal, as they finished recording the 55th disc in a series which in the meantime had met with overwhelming acclaim worldwide. Made in conjunction with the final cantata recording, this film commemorates the occasion. Besides filmed performances of the three last cantatas - Gloria in excelsis Deo, BWV191, Lobe den Herrn, meine Seele, BWV69 and Freue dich, erlöste Schar, BWV30 - the film includes interviews with Masaaki Suzuki and key members of Bach Collegium Japan as well as behind-the-scenes footage.